Poet and wine-grower F.H. de Puymaly was grateful to Diepenbrock for his setting of Belges, debout! (Belgians, Arise! RC 131), so he told him in a letter on 13 October 1916. As a token of his appreciation, he offered the composer the text of Le vin de la Revanche (The Wine of Retaliation), a rather substantial poem of five eight-line verses that sings the praises of the perseverance of the French. With the support of their Belgian, British and Russian comrades, they will prevent the Germans from picking grapes on French soil. It promises to be a ‘good year’. The harvest will produce “le grand vin de la Revanche” (the great wine of Retaliation), which the Allies will drink together when the war is over and, in the distant future, their children’s children too. The outline of the melody of the first strophe dates from 26 October 1916. A month and a half later Diepenbrock wrote down the complete song in manuscript C-28 in three days (11-13 December). Coincidentally, on 12 December Germany made a peace proposal. However, its tone was so arrogant (the full responsibility for starting the war lay with others) that the countries of the Entente could not possibly consider it. Diepenbrock composed Le vin de la Revanche for the voice of Jean-Louis Pisuisse (1880-1927), who was an excellent performer of Les poilus de l’Argonne (The Soldiers of the Argonne, RC 122). In Brieven en documenten (Letters and Documents) it does not say whether Pisuisse actually included Le vin de la Revanche in any of his programmes. Gerard Zalsman (1871-1949) might have sung this song in public, but there is no documentation as to an exact date. Diepenbrock performed the work with Anke Schierbeek (1878-1960) in pro-Allied circles. Diepenbrock decided to produce a printed edition himself, which appeared on 12 February 1917. He dedicated it to Pierre Kroll, a Belgian baritone who lived in Maastricht during the First World War and was a member of the Association des concerts de charité au profit des Belges (Association for charity concerts for the Belgians), founded by Pierre Hans (see RC 131). 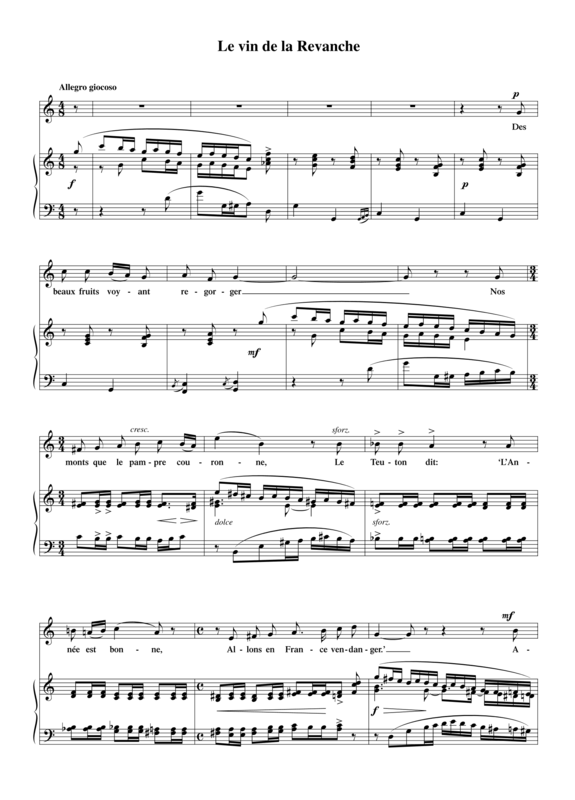 Diepenbrock depicted the combative character of the poem through a bold melody that opens the song and returns several times in the piano in three-part imitation. De ce grand vin de la Revanche!" Ou pour nos braves combattants? Le Belge, le Russe, l'Anglais. De ce grand vin de la Revanche. L'éclat d'un sang qu'on veut venger. Jusque chez nos petits enfants.